This is a GPS application with a guided, professional circular tour, accompanied by the recorded explanations of a voice guide which tell you where to go, when to stop, when to turn left or right and of course, will give you detailed information on each site. Ramla is one of the few towns in Israel to invite the public for a visit to its Great Mosque. Where better to learn about Islam than in the country’s very first and only Arab and Moslem town? 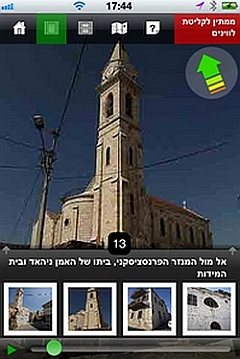 Ramla is blessed with three distinctly different churches. One belongs to the Greek Orthodox Monastery with its foreign flair; the second belongs to the Catholic Franciscan Monastery and houses a rare, 500-year-old Renaissance painting; and the third is the Anglican Church which also serves as a venue for concerts. So what’s Ramla’s connection to Christianity? Ramla is the home of the Karaite Jewish World Center. The Center is happy to receive groups and visitors on its compound which among other things also includes a “classic” Karaite synagogue. Dozens of synagogues of all kinds and denominations are to be found all over Ramla: Traditions, legends, miracles and wonders.